The species is widespread in the southern half of Britain mainly towards the east, becoming scattered in the west and north as far as central Scotland. However X. ulmi appears to be genuinely absent or very rare in the extreme south-east of the country. It is widespread in western and central Europe. The spider usually occurs on low vegetation and in the ground layer in damp situations, especially in marshes, fens, and rough grassland, but in North Essex it is also found in ditches alongside arable fields, hedge banks, roadside verges and woodland especially in open and coppiced areas. Juveniles are often found in ground litter at the base of vegetation whereas adults are usually swept from herbage. 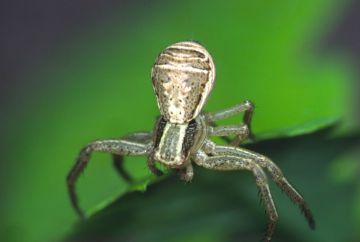 Females guard their egg-sacs, usually near the tops of higher plants. Adults of both sexes are found mainly in May and June, females occasionally into the autumn. Local, but the spider may be frequent, as in north and west Essex. Its absence in the southern and eastern parts of Essex, the driest parts of Britain, may be the result of low rainfall and humidity.